Evan told me a few weeks ago that he feels like he is Clark Kent living a double-life. Working man in a suit and tie during the day, but instead of moon-lighting in spandex and a cape saving the world by night, he's wearing jeans or sweatpants and sitting in lecture like a normal college student. The thing about him is, he likes his day-time identity a whole lot better. 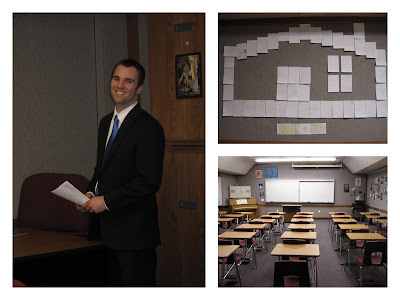 I finally got a chance to go to his seminary class this week and see just what he does all day, I was so excited! So far, I had just watched the background action listening to him prepare lessons and come up with creative learning activities. I never know what I'll find when I get in the car after he's had a full day of teaching. Sometimes there are face cards all over the place. The other day the entire backseat was full of Styrofoam cups with things like "Atonement" and "Apostles" written all over them. Just what exactly is going on up at Timberline Middle School? I don't know what I was expecting, I guess I was thinking back to 6am sessions before Lamar High School where I would be lucky to stay awake through the whole lesson, but Brother Fox keeps class much more lively. Everyone gets a high five or two when they come and and they're dying to tell him what they did for the weekend. Important discussions on things like "Bieber Fever" have to be taken care of before the lesson can begin. Evan introduced me as a "special visitor" and had me introduce myself to the class and them let them ask me any question they wanted. But naturally, he had fed them all the questions that he wanted them to ask, such as whether or not I'm a good driver (lets see... driving through the garage door, car wash with the sun roof open, high centering on a parking block... um no) or what my most embarrassing moment was (falling off a stationary bike in spinning class... real smooth). Thank you Brother Fox for making sure they got an accurate picture. But I was able to impress them with my chocolate chip peanut butter cookies and safely escape the spotlight and leave the rest up to him. They are studying the Doctrine and Covenants right now and the lesson he taught was on Section 93, explaining how the Savior learned "grace by grace" and that we learn the same way. I can't teach the lesson like he did but I can tell you that those kids are so lucky to have such an amazing teacher. All the hours he puts in to preparation totally pay off. The spirit in his lesson was so strong and the kids were completely engaged, sharing stories and giving insights and reading scriptures. He is amazingly patient and there was never a dull moment between 14 year old boys voice's cracking while they attempt to read aloud (followed by an eruption of laughter from the rest of the class) and comments on a childhood dream to become a Powerpuff Girl or Brittney Spears. Somehow he can turn it all into a testimony of how we become more like Christ. That's just talent. It's more than just memorizing scripture masteries in that class. I loved how he closed, testifying of the Savior and directly asking his kids what they were going to do as soon as they walked about that door today to be more like Him. I could use more of those questions in my life. So we still don't know for sure where our lives will end up, but for now I'm going to follow the example of Brother Fox. He has put his whole heart in to his teaching and we're going to choose to believe. I LOVE THIS!!! I just wish I was 14 again and in Brother Fox's class because I am positive that he is the most amazing teacher! AND...STILL so happy that you got yourself such an incredible husband! :) LOVE YOU BOTH!